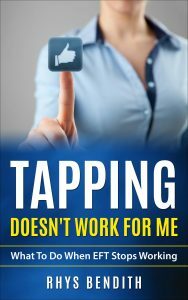 Millions of people around the world have used EFT tapping, many with remarkable results, so when it doesn’t work, why not? The catchall phrase is ‘resistance’ but it’s been my experience that this isn’t always true. If you’ve found yourself saying or thinking any one of these, this book was written for you. It is for those people who are familiar with EFT, who’ve used it and have hit a hurdle with tapping but are willing to back up a little, perhaps learn something new or think about an issue in a different way, and set yourself free. It’s not that you’re an EFT failure. It’s not that EFT doesn’t work. It’s not that EFT stops working. You may have picked up some unhelpful habits when you learned EFT, and they are what this book seeks to address. Hello, I’m Rhys Bendith. I don’t have credentials or expert training in the vast areas of mental health. However, I have had direct and personal experience of living with someone who has complex mental and emotional health challenges, and I’ve seen and experienced so many brilliant instances where EFT helped me and others thrive where nothing else did. Within these pages the focus is on how tapping advice traps for the unwary can lead to problems of their own. I first came across EFT in 1998, and I’ve been using it ever since. I’ve read hundreds of thousands of words on the subject, created an extensive personal library, watched countless videos, taken a few courses, and at times felt as if I was a total tapping failure. It didn’t help that, as an open source and still-growing therapy, a lot of what I was reading and seeing (and trying) was at times confusing, unhelpful, poorly thought out, or in the best interests of the person selling the course or advice. So, if you’re one of the many people who think tapping has failed you, or you’ve failed tapping, please think again. You can thrive. You can set yourself free. If at first you don’t succeed, question the steps you took. Rhys Bendith has been using EFT Tapping since 1998. It has, over the years and decades, assisted enormously in a variety of personal endeavours. As a previously overweight, overworked, and stressed adviser to banks, a national marketing manager for a large financial services provider, and later a business consultant to clients in over 100 industries in several countries, EFT helped him through the transition from value-adding to a values-driven career in education and self help, with profound health and mindset changes along the way. A lifelong interest in education that counts followed, and Rhys wrote courses for a government department assisting to re-skill the long-term unemployed, as well as working on an incubator project to assist unemployed people launch and manage their own business ventures. Rhys spent four years overseas developing courses, modern management guidelines, and writing textbook materials on language acquisition for non-English language learners, from kindergarten to university levels. An avid student with a trade qualification, a business degree, and many certificate courses completed, Rhys has always sought to understand a topic and not just learn it. It’s how he came to deconstruct some tapping processes and search for genuine improvements to them, assisted by many volunteers who were willing to try something new and go the distance with it.